As durable and technologically equipped as outdoor gear is these days, accidents still happen. Things break, wear down, and get holes in them on the trail, which can ruin a trip in a hurry if you’re not prepared. To ensure that your outing continues without hindrance, even when faced with such inconveniences, I suggest compiling a repair kit. Today, I’ve listed a few items I feel are necessary for such a kit, as they’ve helped me or someone I know get through sticky situations on the trail. Honestly, I feel every hiker/camper should carry a reliable multitool on them, but if you normally don’t, then I definitely suggest keeping one as a staple ingredient in your repair kit. Make sure your multitool has scissors, as they are impossible to replicate otherwise and are great at cutting fabric for patchwork or emergency bandages. Models with a sturdy pair of pliers, as well as a strong, three-inch blade, are good assets, as well. Seam grip is one of those items that seem to have an endless amount of uses on the trail. From sealing the soles of your boots to patching tents, this product is definitely a must-have for any outdoorsman’s repair kit. I feel as if many underestimate the practicality and usefulness of a Ziploc freezer bag. These little beauties are lightweight, waterproof, inexpensive, and clear, which makes storing, organizing, and accessing items a breeze. Repair patches are a good idea to keep in any repair kit, and work on tents, tarp, rain jackets, and other material. Many patches are made to adhere to nearly any fabric, and some are transparent and have a little stretch. Speaking of tents, a pole repair sleeve is something I’d also add to the kit. While you’ll rarely need to use one, a repair sleeve can’t be improvised on the trail, so having one available is a good idea. Most tents come with one, but you can also purchase them where outdoor gear is sold. Lastly, I always wrap a few feet of duct tape around my water bottle when I head out for trips longer than a day. 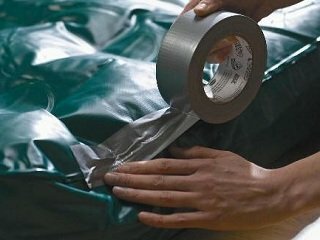 Duct tape can be used to fix or even make things, and wrapping it around a bottle, pencil, or trekking pole takes up zero space. The items listed above are, of course, just a few suggestions that I’ve used and found to be helpful over the years. Feel free to add any items you wish to your own kit. It doesn’t take long to prepare and the aforementioned products are inexpensive to collect. The point is preparation, so assembling an emergency repair kit is a great way to ease your mind even before setting foot on the trail.